Having dispatched of Steaua Bucharest in the Europa League earlier in the week, Chelsea will be determined to keep the chasing pack sitting behind them in the Premier League at bay with a home win against West Ham on Sunday. That victory over the course of two legs against the Romanian club means they are into the last eight of the Europa League, in contention for the FA Cup as well as being a fairly strong bet to qualify in the top four in the league. Many Chelsea fans that it is the league which is the most important and qualification for the Champions League is considered a must, to ward off the likes of Arsenal and the two Merseyside clubs; they must take three points from the game against London rivals, West Ham at Stamford Bridge. Chelsea interim manager, Rafa Benitez will be plotting a revenge mission having been on the receiving end of a 3-1 defeat to the hands of the Hammers in the early weeks of his reign at Chelsea. That defeat was met with disdain by the Chelsea faithful, with the new manager receiving the majority of the blame. History would suggest however that the Blues should do well against West Ham on Sunday as the side from East London have not registered a victory at Stamford Bridge in a decade. West Ham have only won 2 of their last 7 Premier League matches and have been on the receiving end of 9 away defeats this season. The Hammers have been boosted with a win in their last league game away at Stoke City and they will be heading into this game against the current European Champions full of confidence. Confidence will stem from that victory against Stoke but also having ended a 12 match losing streak against Chelsea in December and Sam Allardyce’s men will now target the statistic that points to a failure in beating Chelsea at Stamford Bridge in 10 years. The club from East London are currently 9 points above the relegation zone and a surprise victory in this game would see them being only four points short of the 40 point mark; commonly regarded as the amount needed to secure a team’s place in the Premier League. BBC Sport are reporting that Demba Ba is available for selection having missed the Europa League tie against Steaua Bucharest in mid-week but is expected to start from the bench. Oriol Romeu is Chelsea’s only injured player currently, who has been sidelined with a knee injury. George McCartney (knee) and Mark Noble (arm) are both likely to miss the game at Stamford Bridge as is Joe Cole, who will have to miss out on a game with his old club because of a hamstring complaint. James Tomkins is however, expected to return having recovered from a virus. West Ham have only taken one point from their last six visits to Stamford Bridge since a 3-2 victory in September 2002. There have been 16 goals in the last 4 encounters between these two sides. It’s 12 years since the Blues last lost a Premier League home game in the month of March, a 4-2 defeat against Sunderland in 2001. Fernando Torres has a very good goalscoring record against West Ham for Chelsea however his season has been somewhat of a struggle for the former Liverpool man. 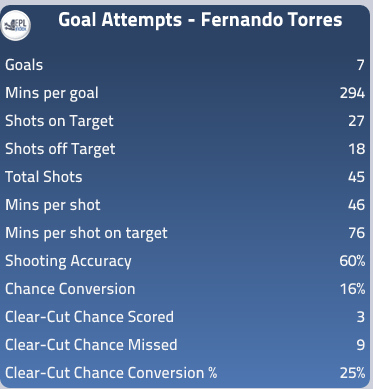 Torres is expected to start again for the Blues and his team will be hoping he will improve upon his goal attempts statistics seen this season so far. The Spaniard has a fairly strong shooting accuracy; with 60% of his shots on goal being on target. Aside from that statistic, it makes for fairly painful viewing for the Chelsea fan. Torres scores a goal every 294 minutes, that equates to over one goal every three full games he appears in. Fans of the West London club will not be shocked by the statistic highlighting his wasteful streak; converting a lowly 25% of all clear-cut chances. These numbers highlight what many fans feared, he is finding it difficult yet again in front of goal for the Blues. Ba will be hoping to take Torres’ place in the starting XI and having seen the statistics attached to the Spaniard; it is difficult to argue against fielding the Senegalese striker ahead of Torres. 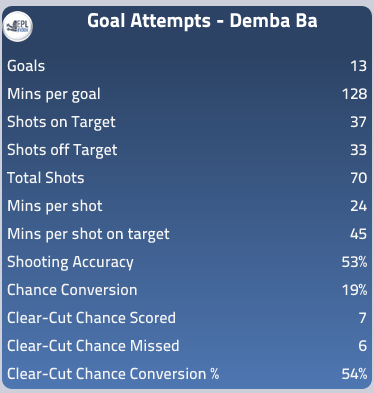 These numbers are calculated throughout the entire 2012/13 season and aside from the shooting accuracy percentage; Demba Ba has been far more prolific in front of goal compared to Fernando Torres. What makes this all the more interesting is that most of these numbers achieved by Ba, were made whilst playing for Newcastle United; a team who are considered to have less quality players than Chelsea as seen by their respective positions in the league. All of the stats from this article have been taken from the Opta Stats Centre at EPLIndex.com –Subscribe Now (Includes author privileges!) Check out our new Top Stats feature on the Stats Centre which allows you to compare all players in the league & read about new additions to the stats centre. Opta world football analyst, covering Aston Villa in the English Premier League. @DanAtherton90 is my twitter account. Categories: Chelsea (NN), Premier League News, and West Ham United (NN).' 'Tags: CFC, Chelsea (NN), Chelsea Opta Stats, Chelsea Stats, Chelsea vs West Ham, Chelsea vs West Ham preview, Demba Ba, English Premier League Opta Stats, English Premier League Stats, epl opta stats, EPL Stats, fernando torres, opta, Opta Stats, premier league opta stats, Premier League Stats, West Ham, West Ham Opta Stats, West Ham Stats, and WHUFC. Run-Ins for Current Top 7 in the Premier League - What can we expect?